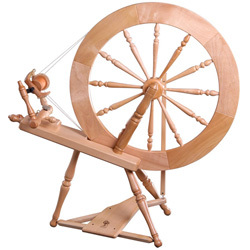 If you buy a wheel or loom with a 'natural' finish, it'll cost far less than a lacquered one, but you do need to do something to finish the wood. It doesn't look pretty and I've seen an unexplained crack in one which was left unfinished. I like to use wax but I've seen good-looking varnish finishes (clear and coloured). Wood dye can be used to very good effect under wax or varnish. I know that teak oil is popular, but I've not tried it until yesterday, when I needed to assemble a wheel very quickly. It's very quick, you just brush it on. It feeds the wood and protects it from drying out. I love the effect it has on the colour - it darkens in a very natural way, enhancing the grain. After a couple of hours it was touch-dry. It doesn't add a shine, but it makes the wood look so good, I may try wax on top when time allows.